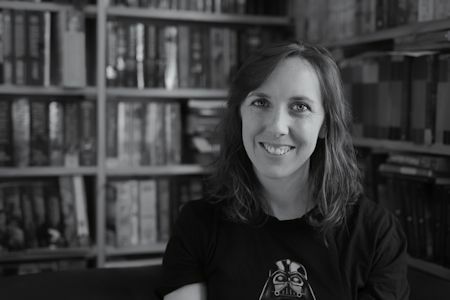 Please welcome Sam Hawke to The Qwillery as part of the 2018 Debut Author Challenge Interviews. City of Lies was published on July 3rd by Tor Books. Sam: There is a photograph of me (aged 4ish) in my parents' photo album, with a picture I painted and the accompanying story written down by my preschool teacher. My face is dark with rage because she transcribed the story incorrectly ("Then I had an idea, and it worked!" is written as "Then I had an indeed, and it worked!"). I must have known then that I couldn't trust anyone else to relay my apparent genius and I would have to do it myself. Hehe. By age 6 I had graduated to stapling piles of paper together and writing chapter titles and the first sentence of each on each page, because by then I had figured out there was such thing as a novelist, and I wanted to be one (my follow-through was a bit poor though). Sam: I work very well to a plot if I have one, but they take me a lot of time and pain and so sometimes I have to plough ahead without one. City of Lies was very well plotted in advance. The sequel I'm figuring out as I go along, madly trying to stay one step ahead of myself. Sam: First drafting, getting the words on screen in the first place, will always be my hurdle. I love revising but I find it very hard to just switch off the critical part of my brain and embrace the creative so first drafting is a laborious process. I live in desperate admiration of writers who can just spew out first drafts and then go back and fix them. TQ: Describe City of Lies using only 5 words. Sam: Poison, treachery, city under siege. TQ: Tell us something about City of Lies that is not found in the book description. Sam: Oooh, tricky. Well, it's not on the back cover but the main large-scale conflict in City of Lies is about cultural divides, and the consequences when cultures forget their roots. Some long past decisions come back to bite everyone in the arse, basically. TQ: What inspired you to write City of Lies? What appeals to you about writing Fantasy? Sam: I love writing fantasy. I can't really imagine writing anything else. There's just something transportive about working outside our own reality. Basically I like having the freedom to work outside what we think we know about the world in order to explore what we do know about it. Also, I prefer making stuff up to researching, so secondary worlds are a natural fit for my lazy self. 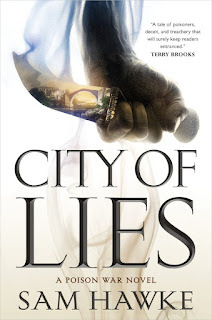 City of Lies was kind of my love letter to the two kinds of books I like reading the best - secondary world fantasy, and closed room mysteries. I wanted to write something that gave me the kind of ratcheting tension of a good mystery/crime novel, but which was also in my preferred setting. TQ: What sort of research did you do for City of Lies? Sam: Not a lot, honestly, other than a fair bit of reading about poisons and supertasting. I'll steal this expression from my friend Rob and say I like to 'research like a ninja', which is to say that I'm not the type of person who spends a lot of time doing background research and detailed worldbuilding before I start writing, but rather just look things up as I go. My favourite system is to stick stuff in square brackets that says something like '[check if you call the railing on a ship a railing or if it has some special name]' or '[check if this is physically possible??] which I leave for Future Sam to handle. TQ: Please tell us about the cover for City of Lies. Sam: The Tor cover is a beautiful hand drawn picture by Greg Ruth of a hand holding a knife, and a city reflected in the blade. It is stunning and I love it so much I bought the original graphite art off Greg for my wall. It's not depicting something specific about the book so much as a flavour - I think looking at it you get a sense of danger and mystery and treachery, and a glimpse at what the city looks like. TQ: In City of Lies who was the easiest character to write and why? The hardest and why? Sam: I found the main characters - the two POV characters and the two main secondary characters - the easiest to write because I knew them so well, I knew what they wanted and what they were afraid of, and how they would react to a situation (Well, when I say easiest, this is a relative term, heh). The tertiary characters were probably the hardest because I needed to give them all distinct voices, personalities and motivations, but I had so little page space to do it in. TQ: Does City of Lies touch on any social issues? Sam: I mean, all books have social issues, don't they, as long as they're about people? But yeah, City of Lies touches on classism, the concentration of wealth in cities, how dominant cultures interact with non-dominant cultures, xenophobia, and the ways that societies under external pressures can turn on themselves. It's not an issue in the book, just a fact of how the society is structured, but gender politics are a completely different beast in this world. There's no strict assumptions about what roles and professions are available to either gender and no concept of marriage (families are defined by blood relationships, not romantic ones). I suspect some readers may regard the basic premise of women being allowed and expected to contribute to their families in the same way as men as a social issue even though it's simply a background fact of the worldbuilding. TQ: Which question about City of Lies do you wish someone would ask? Ask it and answer it! Q: How can I order 1000 copies of your fine publication for all my friends and family? A: Why, thank you for asking, it's available at all good bookstores, or anywhere online that sells good books! TQ: Give us one or two of your favorite non-spoilery quotes from City of Lies. I dodged a stray blow in my direction and, as the man launched himself heavily at Tain again, his drunken focus on this new target of his rage, I chopped into his stomach as hard as I could with the side of my hand. "I just want a cup of tea," I told him bitterly. Research like a ninja, nice! Great interview!